Have I told you, lately, that I love you...uhh...err...excuse my inner Rod Stewart lyrical self. What I really meant to say is: Have I told you... why is it harder to ski down steeper slopes, and why our own time-tested movements seem to do even worse on the more challenging terrain we tackle? Yes, that was the question. Anyways, just as there is a difference in the slope itself, there is a resulting difference in the way we want to ski these slopes to maintain control while we ski, and look good doing it while skiing past the luxury catered ski chalets. Making sure that your body remains over your base of support (a.k.a. your feet) is essential to maintaining an effective, balanced stance that will allow you to make efficient and controlled movements in your skiing. I am going to let you in on my little trade secret - the perpendicular skier. Now I don't mean to bash your lack of geometry knowledge (I would much rather brag about mine), but the perpendicular skier is a great way to think of one's body position when skiing. What is this "perpendicular skier?" Basically, what you want to do is try and keep your torso perpendicular to the slope. (For those of you still struggling with the geometry concept, perpendicular means at 90 degree angles to one another). And why do I bring up geometry at a time like this when we were trying to learn how to ski the steeps? Let me explain. In this image (praise my revolutionary artistic abilities later), I took the skier in the first image and pasted his exact body and skis to the steeper slope in the second image. The key here lies in the angles between the skier's body (represented by the purple line) and the pitch of the slope (represented by the blue line). Therefore, the lesson here is, as you attack the steeps, make sure you lean more forward to maintain a perpendicular or slightly forward of perpendicular body position (See July 2009 article: "A Balance Tip That Is Slightly More Than 'Lean Forward'"). This gives you more balance and therefore control when skiing these steeps. Now go out there and shred up those steeps, and a shout out to those of you on the US east coast - Washington D.C. received more than a foot and a half of snow last week I hear. I wonder which reader received the most...let us know via the comments. And for those metric-system-lovers out there, that is about 46 cm. It's already November. Think snow! NONSTOP Ski & Snowboard is offering one lucky person the chance to win a place on its 11-week instructor training course in Fernie, including return flights with Air Canada, worth over £7,500 ($11,000 USD). NONSTOP’s 11-week course is ideal for a career break, Gap Year or fast-track into the instructor industry. Win this prize and you’ll be learning from some of Canada’s most respected instructors. During the course you can achieve internationally recognised level one and two Canadian ski or snowboard instructor qualifications that allow you to work as an instructor worldwide. You’ll be staying in the NONSTOP Lodge, in downtown Fernie, which has fantastic facilities including ensuite twin bedrooms, swimming pool, hot tub, movie room and ski/board tuning room. And there’s also a bar and restaurant where you’ll enjoy healthy, hearty meals. The prize includes practically all you need to spend a season in the Canadian mountains – flights with Air Canada, a season lift pass, weekly professional instruction, half-board accommodation, plus numerous extra activities like cat-skiing, snowmobiling, weekend trips to other resorts and an avalanche and first aid course. Full details available at www.nonstopski.com/win-a-season-in-canada. NONSTTOP Ski & Snowboard have teamed up with metrosnow.co.uk to offer this amazing prize. To enter visit www.metrosnow.co.uk/competitions until April 6, 2010. Let me start off by saying, I can stop in mid-air...well, maybe not mid-air, but you get the idea. This is actually a very good question, and a tough one at that. There is some debate among professionals about the appropriate teaching methodology when it comes to stopping (the reasons I will explain below), but ultimately there is a need for some practicality above all else. Among beginner skiers, one of the main goals of the American Teaching System (which I believe very strongly in) is to develop new skiers directly into the most fluid, dynamic skiers possible from the start. In the past, ski schools have taught beginner students some skills that actually interfere with more advanced techniques further down the yellow brick road, specifically, the "wedge stop" or "pizza." The wedge stop is a double sided axe. On one hand, it is needed to allow new skiers to stop themselves, which in itself I think is an obvious necessity. If you need further clarification, see the NY Times article about the skier who was unable to stop. However, this wedge becomes a very comfortable safety valve for a frightened and inexperienced skier...too much so if not controlled, thus leading to what is infamously known as the "power wedge," a full-out wedge with skis spread twice as wide as the shoulder-width standard. This is a comfortable and safe-feeling position. However, it is very detrimental to the ski skill progression. Skiers often get too comfortable. Sooner or later, they find it very hard to break this large power wedge position, which makes it almost impossible to continue on to parallel skiing. Therefore, many instructors will teach beginner lessons without any wedge, but instead teach a direct turn stop, that is, turning into the hill to stop. This would be similar to a ice-skate or "hockey" stop. However, it is also harder to stop in this way. One could say, then, that it makes most practical sense to teach a wedge for convenience, but strongly enforce that no power wedge forms. "...at certain speeds, there is no way of braking safely..."
Some will argue this is true. I (and others) will tell you that a fairly skilled skier with good balance can do so. I am sure there is an analagous dilemma in skating. To conclude - yes, you can stop safely. And yes, stopping is important and is taught, but it must be taught judiciously. We want to teach our students in ways that will not only allow them to get up the slope and coast down the green lollipops, but also provide a foundation upon which they can easily improve to attack the blacks. Chances are that if you have spent five minutes on a ski slope before, you have heard the amazingly overused and almost meaningless word in the skiing dictionary - the most given piece of unsought advice that exists in space and time - the ... oh, let's just cut to the chase ... LEAN FORWARD. Lean forward. A simple term that seems to be your skiing buddy's answer for everything. It has come down a long line of useless friends teaching friends and is deeply rooted in everyone's skiing history. Lean forward is an extremely ambiguous phrase. It seems straightforward to an experienced skier, but to someone new to this heavenly sport, lean forward could mean several different things. Should I tilt my head forward? Should I reach my hands forward? These skis are so hard to move on. Should I bend my shoulders forward? My hips? Did I mention it is hard to move while sliding on these stupid skis? And I wish that Alec the smart lass would stop shouting lean forward at me. So instead of shouting the same, useless phrase over and over again, try using some of these more specific and helpful tips the next time you decide to give some unsought advice. Slide your feet underneath your hips or Bring your body over top of your feet - These pieces of advice reinforce vertical alignment of the body over the hips over the feet. They both are two ways to think of accomplishing the same thing. Often, adjusting the position of your feet (and therefore skis) is easier to focus on than moving your upper body. This also provides proper ankle flexion. Stand up straighter - Many people new to skiing believe that skiing should look like the racing pros on TV. This is almost always not the case, as we rarely get to the speeds where those kinds of extreme bending movements are needed to produce such high magnitude forces. When a skier bends over too much, the hips revert back and bring the weight of the skier into the "backseat," or too far behind the ideal central stance. Our weight should be over the center of our feet. Press the front of your shins against the front of your boots - Something that even many advanced skiers forget to remember is that our shins should be in contact with the fronts of our boots at all times. Often, when a skier falls back in his or her stance, he or she can easily fix the problem by putting the shins back in contact with the tongues of the boots. 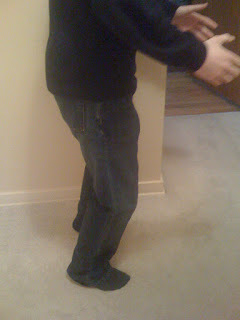 This flexes the knees and the ankles, ensuring a better balanced stance. Equipment note: Here is a simple check to perform to make sure that your boots are better-fitted, giving you more balance while you ski. Put on and buckle your boots. When you stand up straight or flex your knees, your boots should be in contact with your legs all the way around the front and back of the legs. If there is wiggle room, tighten up your boots so that there is no more extra space. Bob Shostek, PSIA Examiner and former PSIA-E President, recommends the following: Velcro your power strap, or booster strap, underneath the outer shell of the boot (the shell contains the buckles). The straps should be velcro-ed in between the soft part and shell part of the boot. Then, buckle your boot shell over top of the already connected power straps. This will give you a tighter "seal" around your leg by the boot, and you will notice more control in your skiing. Additionally, you can place wedged pieces of a soft but sturdy material between your leg and the boot to eliminate some of the extra space. When there is less or no space between your leg and the boot, your own movements transfer easier, quicker, smoother, and with less effort. When there is room for error, it takes large, gross movements to make a small difference in your skiing. This trick will result in more fine-tuned movements that are able to allow you to move while skiing without large, drastic, and visible movements of the lower leg. So after you perform your boot test and adjust your power straps, head up the chairlift, and push your friends down the newly introduced mountain, give more specific advice than lean forward. Give them advice that they will actually understand, comprehend, and execute. And that's how memories are made. For all of those television experts out there, the Science Channel will be airing an television episode of "How It's Made" - "Dynastar Skis" on Friday, June 19th at 9:00 p.m. EST. This video is now available online at http://science.discovery.com/videos/how-its-made-alpine-skis.html. This will be a first of its kind special where a manufacturer is revealing how indeed they make skis. This will give good insight on how they are put together, strengths of different types of skis, as well as how to maximize your own ski movement efficiency. Note: I am not paid by the Science Channel, Discovery, or Dynastar to promote this television special. However, if you are an employee of the Science Channel, Discovery, or Dynastar and would like to pay me, please contact me at the given contact info from my profile. Here is a crazy cool little trick to help yourself gain more control over your directional movement in your skiing. But first, what do I mean by directional movement? The key to the sliding glass door of modern skiing is consistent and correct directional movement. You always want to move each part of your body towards the direction you want to go. This is extremely important.You always want to move each part of your body towards the direction you want to go. And in case you didn't catch it the first time (or the second): You always want to move each part of your body towards the direction you want to go. This equals efficiency. What most people don't typically think about the is direction of a turn. When you turn right, you are not making a 90 degree turn measured by the protractor you still have from tenth grade geometry class. It would be an ugly turn, an uglier wipeout, and a sad, sad life story that you still have your protractor from tenth grade geometry class. You should think of moving your body on a diagonal - that is - both forward and right. Let's take for instance, the feet. When you want to turn right, you are obviously going to move both your feet towards that direction. Similarly, you also want to move your inside knee forward and to the right, the tips of your skis forward and to the right, your leading toes forward and to the right, and you plant your pole forward and to the right. This is what establishes your turn. If you want to make a shorter turn radius, you should move more forward and less to the right. If you are making a long radius turn, you will want to direct your movements more to the right and less forward. So, we know what directional movements are - movements of specific body parts that are directed to your new turn orientation and shape. Now, let's get to that cool trick... I gained this pearl of wisdom from Eric Anderson, PSIA Level III Instructor and Ski School Director at Wisp Resort in McHenry, Maryland. Stand in a flat area in the snow so that you are in a balanced stance with parallel skis. Take your poles and draw a box, or rectangle, in the snow that surrounds you and your skis. See the diagram for an illustration. Roll your inside ankle and pressure your inside foot diagonally towards the corner. In summary, making sure that you move directionally instead of sideways makes your turns more efficient, makes you look like a much more radical and skillful skier, and in case that isn't enough, it also allows you to both finish and initiate your turns more successfully and evenly in both directions. So next time you take a turn, move towards the corner of your box, and leave the protractor at home. Typically, the last thing you want to do after arriving at one of those fancy Zermatt chalets and first getting on your skis is skating. However, this is something that is severely underrated by all levels of skiers. Some of you may not even know what skating is (if so, go request a lesson on skating right away and tip your instructor lots of cash, preferably me). To this end, it is important to take a closer look at what exactly happens during our skating on skis. So, what is skating? Basically, skating is exactly what is says, except on skis as opposed to ice skates. You push off of one ski, balance yourself on the other ski, and keep the cycle going. It is a great maneuver to propel yourself forward when you need to get somewhere on the snow that simply facing downhill and skiing will not allow. Why is skating so important? Well, what's not important about it? Not only does it allow you to efficiently and less-energetically get yourself back to your skiing partner who fell (or further away from your skiing partner), it incorporates all of the basic skiing movements that you need to ski successfully anywhere else on the mountain. It is said that you can tell how good a skier is just by looking at him or her skate, because it is a test of how well you blend and execute your basic movements. In summary, Martin Heckelman writes in The New Guide to Skiing that "While skating, the legs are taught how to 'flex' and 'extend' ... the body is trained to shift weight from ski to ski and one learns how to change direction easily while moving. Skating also helps to improve a skier's body awareness and balance." To push off of your ski, bend the knee of the ski you are pushing off of. Feel the power and potential energy in your bent knee, then extend and push that knee towards the new direction. The most important principle in skating is to make sure you are pushing off of the inside EDGE of your ski rather than pushing off of a flat ski. Always, always, always make sure you are pushing from the ski's edge. This maximizes energy efficiency, and thus will not tire you out as quickly. After all, skating does require energy, so make it easier for yourself by using the edges. To do this, make sure you roll the ankle of your ski in contact with the snow inwards towards your big toe side of your ski. After pushing off of the big toe, inside edge of your ski, glide your body out toward the direction you wish to propel towards. This should be in the same direction as the new ski in contact with the snow. You want to make sure that you do not look like a wobbling Tower of Pizza - that is, do not move your body side to side much. Focus on gliding all your momentum towards the direction you wish to go in. If you were driving a car and wanted to go straight, you would steer straight and not sideways, right? It's no different in skiing. Also, when landing on your new ski, there is a quick feedback test to see if you are balanced. You should be landing on the entire ski evenly. If you notice the new contact ski hits the snow with the tip first, you are too far forward in your stance. If you see your tail hit the snow first (more common), you are too far back in your stance. See the Balance post to adjust this. Skating is a skill that comes only with practice, so, go practice! As you get better at it, you will notice that you feel less tired after making the same dash to the chairlift. It is a great feeling to get there and realize you are not out of breath like you normally are, all due to technique improvements. As you get better, you can also practice skating while gliding down a gentle slope (on a green circle trail) or on even more advanced terrain if you feel even more advanced. This will require practice, some athleticism, and more precise control and timing while pushing off of your edges. It will, however, allow you to pick up some speed. And if you don't like speed, go home. Or just practice a little more. Many crazy people are always trying to bust the biggest move in the trauma park...I mean, the terrain park. However, few skiers really know how to approach new terrain features or how to grow comfortable and properly learn how to ski them. What's the real way to learn so that you don't tackle your tips and tails? Magic. Actually, magic is not nearly cool enough for skiing. So instead we use the ATML method. What is the ATML method? Well it breaks down to the following: Approach, Take-off, Maneuver, and Landing. By focusing on each of these parts separately and then blending them together (in the correct order), it is much easier to develop your skills as a freestyle skier, whether it's for the superpipe or the small bump on the side of the green circle you are skiing. Skiers and snowboarders alike use this method. Approach: This is where all the fun starts. Have you ever started toward the ramp of a wooly mammoth-sized jump and then realized you have too much speed? Well instead of letting your bladder go, try analyzing the approach beforehand. Before you even put on your equipment, walk to the beginning of the feature (a feature could be a jump, a rail, a box, etc.) and LOOK at it. Look at the differences between one spot and the next. Touch the feature and feel what it is like. If it is an icy, slick rail, you will approach it differently then if it were a rough, course, dry box. After analyzing the approach, determine what speed you think would be appropriate to enter the feature. Also look at where would be the best area to approach it from uphill (i.e. Would it be better to come from the left side or right?). Take-off: The take-off is pretty self-explanatory. The main focus here is how you want your body to be positioned at the time of your take-off and how aggressive you are going to be with the entry. Maneuver (or Method): This is the actual trick you will be performing. It may be simply keeping your balance in the air, a nosegrab, an iron cross, or sliding on the rail. It is important to know ahead of time what maneuver you plan on performing and how to do it. Landing: In your landing, it is important to land with soft, flexed joints - somewhat bent knees, flexed ankles, flexed hips. You do not want to stiffen up your body in fear because you see that you are about to fall to a scary death. (The chances of that actually happening are slim - you usually won't walk away with more than a broken clavicle or a fractured vertebra). Stiffening up your body makes you less flexible and more prone to stress - that is, bones break more easily...ouch. Make sure you aim for a nice, balanced position so that you finish looking like a pro. Then smile for the judges/TV camera/mom/imaginary stadium there to watch your magnificence. After you have figured out each piece of the puzzle independently, then piece them together to make a masterpiece. It is art really. First, remember that balance is essential to any type of skiing - including freestyle. Go back to the "Balance - The Foundation for the Rest" post to review some necessary balance skills. Second, wear a helmet, wear a helmet, wear a helmet. And if you are truly interested in deeper thought, wear a helmet. Wrist guards can help too. You can buy some cool ski accessories for low prices at SnowShack Ski and Snowboard Accessories. Disclaimer: SkiBlog-SkiBlog and any of its authors are not responsible and are not liable for any injuries or deaths associated with your skiing. We will accept recognition or cash for gold medals or first place awards though. This is commonly known as leg retraction and leg extension. It applies mostly to more advanced, dynamic skiers at moderate to fast speeds and helps out a ton in starting carving turns. The principle is that through your turn, you want to bend your inside leg/knee and extend your outside leg/knee. If you need a review of what the inside and outside skis are, see the picture below. So, you bend your inside leg, extend your outside leg, pretty simple right? Well, ya it is pretty simple. To do this, you want to push down with your outside leg in order to extend it and then simultaneously bend, or retract, your inside leg by bending your knee and lessening that ski's pressure on the snow. Why do this? While the modern world says, "Everything comes down to money," the physics world says, "Everything comes down to energy." When you extend your outside leg and pressure your ski, the ski builds up mechanical potential energy from the pressure you are applying to make the ski flex. On your inside ski, the retraction (bending) releases the energy and allows for a smooth transition from turn to turn. This will result in a feeling of your skis jumping forward beneath you as all the energy releases. Martin Heckelman writes in his book, The New Guide to Skiing, "When you retract your leg, you release this energy, causing a rapid and fluid movement of your body downhill across the skis. This enables you to very quickly press onto the new outside ski, which will allow you to carve the ski very early in the turn." 1.) Make sure you continue to roll and flex your ankles in the direction of your turn. 2.) When extending, make sure you are on the uphill edge of both skis. The outside ski will often be pushed downhill so that your stance opens so wide that little kids think it's a tunnel for them to go through. Monitor this and keep your stance at a constant width throughout the entire turn. So, get out on the luxury ski mountain and bend your inside knee, extend your outside knee, and you will be well on your way towards becoming a better, more hip skier than your skiing buddies. And that's what everything really comes down to. Although bumps are a much different terrain than typical downhill skiing, there is a secret. You actually will use the same movements as normal skiing, just in a different fashion and using different tactics. There are several different strategies to tackling moguls (metaphorically, not literally). You may want to vary yours depending on conditions, ability level, comfort level, etc. 2.) Turn on the side of the bump and across the back/downhill side of the bump. 3.) Continue your turn as normal. 4.) Stay in your turn until you slow enough to a comfortable speed while spotting your next bump to plant and turn around. By simply focusing on planting on the top of the bump and then turning around its side, you will find a smooth rhythm that should help. Note that this is not the same as skiing a "zipper" line down between the moguls like the pros. That requires much athleticism, strength, and endurance. David Lind and Scott Sanders, in their book The Physics of Skiing, describe to readers, "When skiing moguls, the skier should unweight - that is, release the edge of the ski - at the sides of the trough where the normal force is reduced and then skid the ski using counterrotation of the body, which will set the opposite ski edge into the snow and initiate a turn." A little technical, so let me explain. Basically, you are naturally going to experience some flexion and extension of your knees. Let them do this - don't go against it. You want to keep your hips the same distance from the ground so that your upper body doesn't bounce much vertically. The bounce is going to come from flexing and extending your knees underneath your body. Another way to think of this is that you will be picking up your skis off the ground and then landing back down on them. Turning on the sides of the bumps, or ideally, the peak of the bumps, allows you to maximize your movements when the force on your skis from the snow is at a minimum. Lind and Sanders summarize by writing, "Simply stated, this physical analysis shows that skiing a banked turn off the top of the mogul is the easiest and most effective strategy for skiing a mogul slope." Don't just take it from me - there you have it from the physics experts. So, remember to NOT turn before a bump in the icy part where everyone and their brother tries to turn. Do turn on the peak of the bump where there is soft snow that no one skis on. This makes it much easier to turn your skis, and also is much easier on your knees and legs (especially beneficial to mature/experienced skiers and casual skiers). Also, balance, the "Foundation for the Rest," becomes critical in the bumps. Make sure you have a good, central stance and that after your pole plants, you keep your hands and arms in front of your body. Trying to keep it simple, this is what skiing the bumps all boils down to. Follow the above tips, and you'll look more like a skier and less of a linebacker on the slopes. Are Your Skis Keeping Up With You? In my last post, I went over some of the basics of ski design and engineering and how these characteristics affect your skiing. 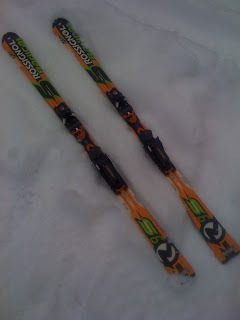 Now, I am going to brag a little about my latest ski purchase, a set of Rossignol Radical RX 9's. I bought them from Mike Stewart, one H-E-double hockey sticks of a skier - a Level III PSIA at Wisp Resort and a Rossignol sales rep.
Why did I get these skis? A few reasons. First, they have an amazingly chick-picking up color scheme. Second, they have some physical characteristics I like too. When I was looking for skis this year, I wanted something with a stiff tail end and low torsion. Translation: the rear (tail) end of the ski does not flex or rotate much. What does this accomplish? This absorbs energy throughout the turn and then releases at the end of the turn, resulting in a turn that "shoots" you out at the end. Bottom line, I wanted something that would rip. These did the trick. They also have a sidecut radius of 13 meters - can you say tight turns? If you are more of an advanced skier who is looking for some skis that are speed demons, super responsive, and carve up the whole mountain, these are the type to get. Tell your ski shop that you want a low torsional, stiff tail. 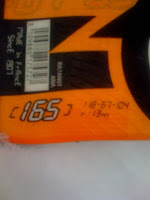 I also went up 5 cm in length from my previous skis to 165 cm. This lets me go a little faster. All I have to worry about now is controlling these rockets on my feet. These things are a blast to ride on. Also, I want to point out that these skis are a 1-2 year old model. You do not have to have the newest high end skis to get great skis. I found these, demoed them, felt how they performed, liked them, and purchased them. Done deal. Are your skis keeping up with you? If not, it may be time to visit the ski shop to look at some newer skis. I have been hearing many questions lately about ski equipment. Does it make a difference if I use short or long skis? What really is the difference in equipment? How much does it really affect my skiing? Although most people think that equipment doesn't really affect performance (and to a certain degree this is true), rapidly changing technologies in skis have made staying up to date with equipment more important than ever. More and more, the equipment you have is starting to make a difference in performance. The majority of ski equipment questions arise from the good old-fashioned long, straight ski to the newer shaped and shorter skis primarily in use today. Around 1990, skis started to come equipped with shaped, or parabolic, edges as opposed to skis that had very little sidecut to them. That is, older straight skis had a nearly constant width from the tips to the tails. Newer skis typically have a wide tip, narrow waist, and wide tail. The reason that shorter shaped skis came about are because of the easier turns that are made possible. Long gone are the days of measuring your ski height by holding your arm up high and buying skis that came to your fingertips. 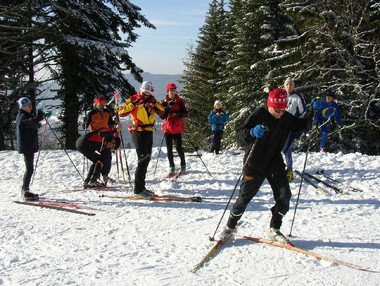 Nowadays, beginners use skis from chest to chin height, while more advanced skiers typically do not ski on boards longer than their own height. The shorter skis allow more better control of the skis, thus making turns and maneuvers much easier. Try going out sometime and skiing on verrryyy short skis. 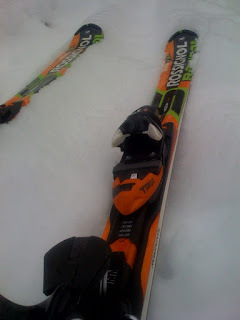 Although they will be a little less stable and feel somewhat flimsy, you will find it almost too easy to turn your skis. The appropriately sized skis can put the dream in dreamy skiing. The sidecut in a ski also accomplishes easier turns. If you layed a shaped ski with sidecut down in the snow, it will actually turn by itself. The sidecut causes the edges to catch in the snow and thus turn the ski. Compared to straight skis, these new shaped slabs of skis will rock you into a whole new ski generation. While ski size is the most important factor in the equipment, there are other mechanical characteristics as well. Torsional stiffness, ski flexure, and other properties determine how your ski will react to your movements and the snow. Racers like stiff torsion in the tails to transfer a maximum amount of energy into their next turn. A small sidecut radius allows tight, carved turns. It is these elements of your skis that allow you to rip down a mountain while somehow miraculously staying upright on size 160 shoes. If you have ever been in one of my lessons, you know that I always preach "balance" as the key to skiing. It is the first thing I teach, no matter what level the lesson. This skill is important if you are skiing the small mountains or the luxury ski resorts. Balance incorporates all of our movements in skiing. Without good balance, we are not able to make effective ski movements to control our skiing. If you play any other sports, many of the movements are the same and will be easy to relate to. 1.) Feet width - Ideally, you want to position your feet so that they are shoulder-width apart relative to one another. This is most people's body's natural stance. In women and children, the stance will tend to be slightly wider (feet are further apart) due to the anatomy of the pelvis and femur (upper leg) bones. You can practice this anywhere - at home in front of a mirror, in the lift lines or on the slopes. By giving yourself an appropriately balanced stance with good feet width, you will enable yourself to make better movements in your skiing. 2.) Ankle flexion - This is quite possibly the most overlooked skill in advanced skiers. Ankle flexion is a very important movement in maintaining proper balance during any type of skiing. The movement you want here? Imagine you are taking your foot off the gas peddle in your car (or off the brake if you are a speed demon). Flexing the ankle so that your toes point towards the sky is called dorsiflexion. You want dorsiflexion in both ankles while skiing, especially throughout your turns and especially on your inside ankle. By incorporating the apprpriate ankle flexion into your skiing, you will allow your legs to make more natural and effective movements that will result in smoother and more effortless turns. Conversely, you do not want to push down with your ankles/feet, producing plantar flexion or extension of your ankles. This often happens if your are pushing down or trying to pressure your outside ski during a turn - avoid this! 3.) Knee flexion - While "bending your knees" is probably one of the oldest sayings in the book, right next to "lean forward," proper knee flexion is essential to maintaining good balance in your turns. There are two types of knee flexion you may have: horizontal and vertical. When you bend your knees, and your femurs (thigh bones, as I've heard it said) become parallel to the ground, this is horizontal knee flexion - your upper leg is horizontal, like the picture to the left. This is bad. When you have horizontal knee flexion, your hips will revert backward and your weight falls instantly backwards. I don't need to tell you this is bad - afterall, you always want to "lean forward!" 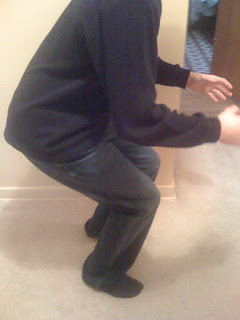 When you bend your knees and your upper leg is perpendicular to the ground, this is vertical knee flexion - your upper leg is vertical, yet your knees are still bent. The picture on the right shows this. That is what we want. When you have vertical knee flexion, it positions your body in a central stance while still properly flexing your joints. 4.) Eye contact - Make sure you look where you want to go. This means in front of you, not looking down at your skis, not at the tree 20 feet ahead of you. Have you ever been walking in the mall or on the sidewalk, been looking at a window showcase, and before you realize it you start walking in that direction? Same thing applies here. Your body will naturally follow where your eyes steer. Therefore, when skiing, focus your eyes on the apex of your next turn, around the tree, so that your body will go that way. This is something especially important to teach beginner skiers while they are getting comfortable with their new five foot long feet, but it is also something that expert skiers need to revisit every once in a while. 5.) Body alignment - Although it may seem obvious, you always want to make sure you are keeping your hips and upper body aligned and directly above your base of support, your feet. Not to the front, not to the side, not to the back. Many advanced skiers are guilty of violating this rule when they try to get very dynamic and flashy in their skiing. You try to get on a high edge angle by leaning your body to the side. Here's a little test to see if this includes you: Ski on an easy green trail. Try making wide, super G turns now, but going very slow. When you try doing this at a slow speed, you will fall straight over the side of your skis. Now, make sure you get up quickly and brush the snow off to make sure no one saw... We often get away with leaning our body sideways at high speeds because our speed and momentum are able to keep us upright. The lesson: make sure your hips stay on your center axis, your midline. They can move slightly, but should not cross over the vertical planes created by your skis. Also, for fore-aft balance, it is easy to tell if you are off-center in your skiing when either the tip or tail of one of your skis lifts in the air during a turn. Make sure you keep your whole ski in contact with the snow. This will maximize your balance, style, and control on the slopes. Those are my top 5 balance tips. If you have any more or would like to comment on any material, please do so! Focus on these out on the hill, and you will see yourself in a more balanced position while sking, looking more graceful to the chairlift viewers above, and skiing more in control. Nothing feels better than that.